Additional view providing a closeup view of the pattern. Additional view showing more of the pattern, the inner border and the large handles. 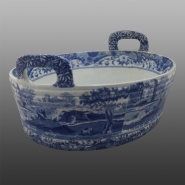 An earthenware molded oyster pan printed in blue in the Italian pattern. It has faux molded coopering to the sides that mimic wooden boards and coopered ribs. The pattern was based on a Claude Lorraine pastoral landscape of 1638. The border is copied directly from a Chinese export porcelain design. Only a few examples of this shape are known.